Here are the front pages of the newspaper I work for, the York Daily Record/Sunday News, from September 12, 2001, and this morning. I note proudly the great work by my newsroom colleagues on both of these editions. In 2001, they had all day and night to produce a comprehensive report on the day's shattering news. Last night, they had well under two hours to tear up the front page and coordinate strong reporting, editing and design for the new front page. 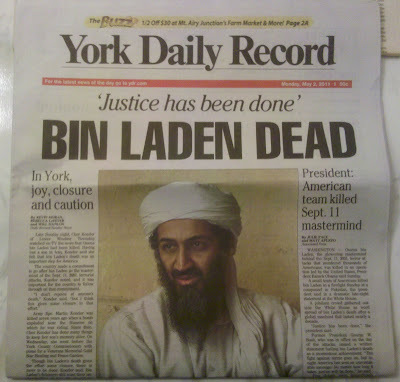 How many copies of the 2001 York Daily Record are still in existence and are kept safely in drawers, closets, attics, etc.? And how many copies of either of these newspapers will still exist 50 years from now? Plenty, I'm guessing. It's fairly easy to find copies of significant newspapers from World War II and the moon landing, for example. These are the significant keepsake newspapers of our time, and they will be kept and passed along to future generations. Here's an article from Poynter on today's national newspaper front pages. It also includes links to other newspaper galleries related to the September 11 attacks. And here's a link to today's best photo, from the New York Times, of reaction to yesterday's news. 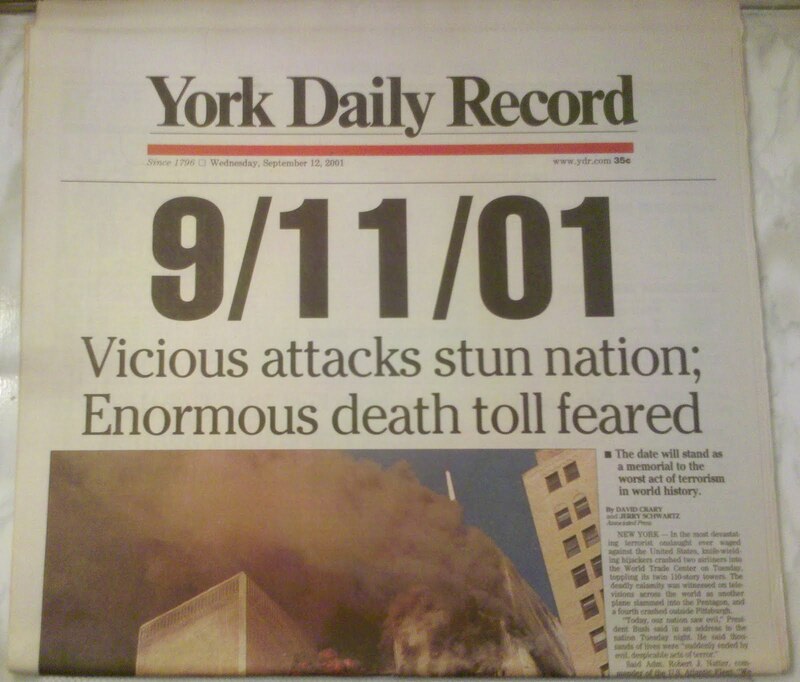 Also: My column on the 10-year anniversary of 9/11 for the York Daily Record/Sunday News. Yes, that is definitely the best photo. The Denver Post is using it online, which is where I saw it first. Thanks for sharing this! As an ex-New Yorker, and a Federal Civil Service Employee, I experienced the events of September 11, 2001 with a unique viewpoint; I knew many people who went to work in lower Manhatten, and I myself, worked in a large Federal Complex, could we be a target, I thought. Heartbeat by heartbeat, horror by horror, the events unfolded that dreadful day. When my tear filled eyes gazed upon the last twin tower falling, coming down in such a straight line towards its base, it was though a stake was forced downward into America's heart. Later that morning we were told to evacuate the building complex; "Just to be safe." they told us, "just to be safe." Yeah, right; that second tower, that stake driven down into America's heart made us all a bit un-safer that day, didn't it? I remember watching Palestinian children laughing, dancing, and smiling, when they heard the news that our country was successfully attacked by Muslim Terrorists. 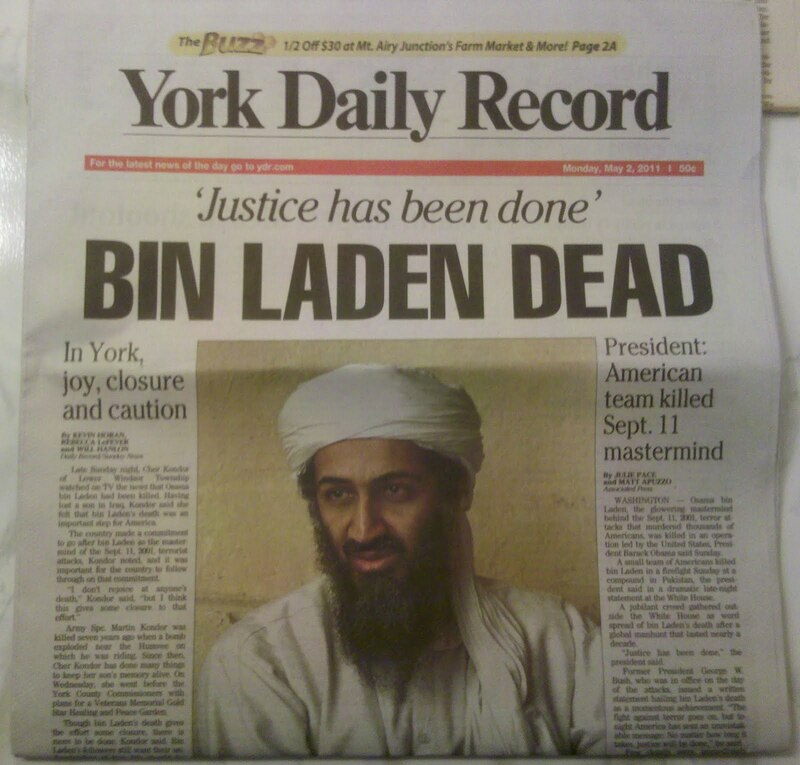 My choice of Bin Laden photo would not have been the one the York Daily Record chose. I, and many other Americans, would have preferred the photo showing him with the bullet holes in his head - something unreverent, if you can understand my feelings.